Posted August 20, 2014 by Julia Kidwell . It sounds silly, but a lot of small business owners feel uncomfortable asking their clients for a testimonial. It’s understandable that you want to stay gracious, but if a customer gives you a compliment about your product or services, ask if they would be willing to review you on Yelp.com or Google+. Online reviews are the new form of word-of-mouth and chances are, if your customers see value in what you’re doing they’re going to want to tell someone else. 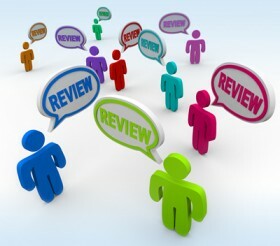 Simply asking for the online review goes a long way! As the SEO and Localization guru at Automated Marketing Group, I’ve had our customers come to me asking how their clients can review them online. They’re being approached by their customers wanting to leave testimonials, but simply don’t know how. I’ve created step-by-step instructions on how to leave a review on Google+ and our clients have been leaving them on their counters and handing them out to customers with their receipts. Showing your customers how easy it is to leave a review can help them make the leap. Your clients read your newsletter because they want to stay up-to-date on what is happening with your business, and this is a great opportunity to ask for an online review. With a link to your Google+ or Yelp.com page and a short Call-To-Action, your customers will be more likely to click on the link, go directly to the site, and leave a raving review of your business. Why not add links to your website too?! A simple Call-To-Action with a link to a review site at the top of your homepage is a great and subtle way to ask for a review, and make it easier for current customers to leave one for your business online. Don’t stop there! There are hundreds of ways to incorporate online reviews into your online and offline marketing strategies, and using them will help boost your visibility and reputation online. For help with your SEO and reputation management, give us a call to see how Automated Marketing Group can help. Leave a review for Automated Marketing Group on our Google+ or Yelp.com page about your marketing experience with our team!